This is Michael Lortz’ second piece as part of his June residency at FanGraphs. Lortz covers the Tampa Bay baseball market for the appropriately named Tampa Bay Baseball Market and has previously published work in the Community pages, as well. You can find him on Twitter, as well. Read the work of all our residents here. According to the old stereotype, Florida is an elephant graveyard where everyone’s retired grandparents go to spend their final years. They drive slow, play bingo on Wednesdays, and clog the roads on the way to their early-bird specials. The reality, as is frequently the case, is much more complicated. As I mentioned in my first article, Tampa Bay is a growing region. Not only economically, but also in population. Earlier this year, the Tampa Bay Business Journal reported that the region of Tampa-St Petersburg-Clearwater is expected to top 3 million people by the end of 2017. According to the US census, approximately 330,000 people in Tampa Bay are over 65, or 11% of the population. A significant portion, but far from the majority. Transplants are a large segment of the Tampa Bay population. In 2014, the New York Times published an article depicting where the population of each state came from. According to the Times, only 36% of Florida residents were natives, 8% were from New York, and 8% were from other Northeast states. We can probably safely assume many of the urban parts of Florida have a higher percentage of non-native Floridians. Which means Tampa Bay may have a higher percentage of transplants than other parts of Florida. This population diversity has a huge impact on sports fandom in Tampa Bay. According to a Facebook study in 2015, only 50% of Tampa Bay area Facebook users “like” the Rays. We can’t say Facebook is entirely indicative of the whole population, but it might be a big enough sample size to estimate, especially for younger fans. Just 50% is not good. Since 2007, the Rays have promoted the idea that they are working on the “next generation” of Tampa Bay sports fans. Owner Stu Sternberg and staff have said many times that building a successful fanbase will take a generation or two. In theory, this is a good idea. There’s little the Rays can do to convince a retired New Yorker who grew up watching Mickey Mantle to abandon his Yankees fandom and root wholeheartedly for the Rays — especially not with the Yankees’ spring-training facility across the bridge in Tampa. These customers are good for a few games a year, when the Yankees are in town. Ditto for retired Red Sox fans, Tigers fans, White Sox fans, or any other team in the American League. Retired fans of National League teams may root for the Rays as a second favorite due to league affiliation, but they will never be pure-blooded Rays fans. When you have limited resources in a small market, minimal effort should be put towards winning over fans with deep-seated opposing loyalty. Fans without that sort of loyalty are an easier target. The Rays believe the future of their fanbase came into existence at the same time the franchise came into existence. Kids born in 1998 were 10 when the Rays made it to the World Series and will be 19 this year. Kids born in 1998 are now making their own buying decisions and, in many cases, making their own income. These young fans should have gotten interested in the Rays during the time of Longoria, Price, Zobrist, and Shields. That’s a good era in Rays history with which to bond. But there’s a big problem with the Rays’ course of action – a giant weakness in the philosophy that may hopefully bind the team to the region for current and future generations. The Rays are targeting the Millennial generation, a mysterious group born between 1980-ish and 2000-ish that is often written about, often analyzed, and often blamed for the failure of society as we know it. Unfortunately, there’s ample evidence showing what the Rays are doing currently might not lead to butts in the seats nor increased traditional revenue. A few weeks ago, the New York Times featured a lengthy piece on the Yankees’ marketing and their struggle to pack Yankee Stadium in the post-Jeter era. Within the piece, Yankees front-office personnel discussed their thoughts on how Millennials perceived the Yankees experience. In order to bring younger fans to the ballpark, the Yankees lowered prices and created new experiences. This is the Yankees, a team with generations of fans, and one of the biggest sports team brands in the world. What chance do the Rays have hinging their entire existence in Tampa Bay on an age group with which even the Yankees are struggling? Surprisingly, the Rays have a very good chance, if they play their political and financial cards right. According to Time Magazine, the Millennial population in Tampa Bay has increased 3.6% since 2010. They’re a big part of Tampa Bay’s future. Their impact is the reason Tampa Bay Lightning owner Jeff Vinik is hosting a Millennial Impact Forum in downtown Tampa later this month. If the Rays can find the ideal location and the ideal financing for the ideal new stadium, they could create a new era in stadium experiences – breaking the mold as Camden Yards did in 1991. Whereas the Rays began play in the last of the cookie-cutter domes of the 1970s and 1980s, they now have a chance to create their own future, cater to a new generation, and build a home that is the envy of Major League Baseball. Both from interviews I have conducted with the front office and a study of their public efforts, I gather that Rays leadership seems to understand the stakes. 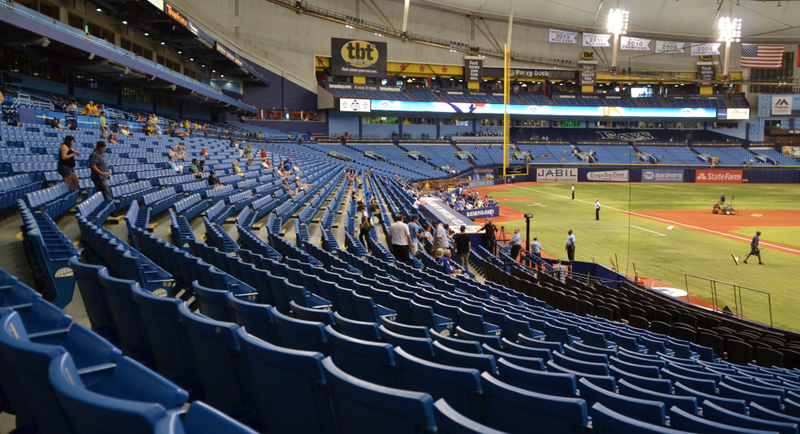 If all the ifs work in the Rays’ favor, the franchise has a chance to mold the stadium to how different generations want to experience the game. Innovation is on the Rays’ side, with a blank slate and plenty of research on their target customers. The Rays need to be creative in order to make revenue on the Millennial generation – especially if their purchasing habits will drive the Rays’ revenue in years to come. Combined with a new TV contract – perhaps also a new more fluid model based on performance and ratings – and other revenue streams, the Rays might finally be able to generate the revenue needed to compete with the rest of the AL East. I know writing about Millennials is overused and cliché, but they are the future of the Rays fanbase. Including and attracting them is essential if the Rays want to survive in Tampa Bay. We hoped you liked reading Tampa Bay and the Millennial Challenge by Michael Lortz!